Try the Dumplings, the beef. Beer or Wine ( or Sake ). Come around 5.45pm or else don't forget to book. You can eat alone at the counter, great for singles too. Excellent service, friendly and fast. Honestly, this place, with it’s slightly wired but delicious mix of Asian foods, is great. 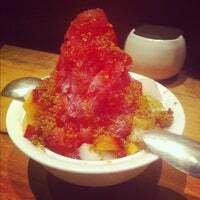 It has a brilliant fermented background flavor and really interesting and attractive tastes and textures. Love love love this place. 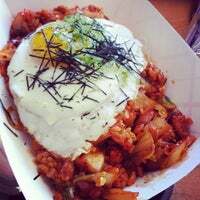 Kimchi fried rice w/ 4505 spicy hot dog is amazing. 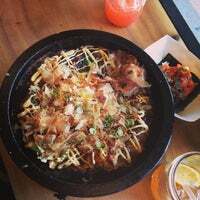 Okonomiyaki is spectacular. Chill out afterwards by grabbing Bi-Rite Ice Cream next door or Bebebar down the street. One of the best meals I've had in San Francisco so far. 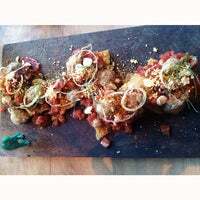 Ordered the stonepot (image), oysters and tartare for the 3 of us (you'll need an extra dish if you're really hungry). Enjoy! Run over and order the Ramagnolotti, a mash-up of ramen and agnolotti with onsen egg, pork belly, and nori. Crazy go nuts good. 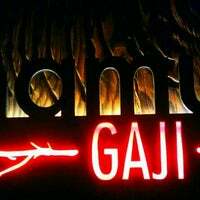 Namu Gaji was great! 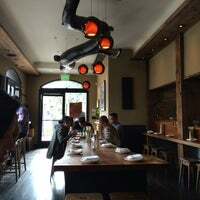 I loved the ambiance and the wood tables. Service was very friendly. We tried the Fried Rice, I honestly expected more, but it was really good. and the fries were really unique! real talk- their Korean fried chicken may be the best fried chicken in the Bay Area. two big juicy pieces of crispy, sweet heavenly bird. Their shaved ices are great. The flavors rotate daily. The flakes of ice have a nice texture as they melt in your mouth. It's refreshing & lighter than most desserts so I don't feel like a pig after. The Korean fried chicken was awesome. Perfect balance of sweetness from the breeding (think chicken and waffles), tangy/spicy from the glaze, and savory from the dashi gravy. They serve the Korean style fries and tacos during their happy hour. 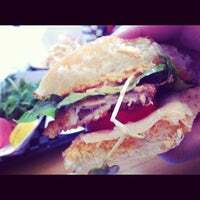 Go there for an early dinner so you can start with happy hour food then order dinner when dinner service starts! Stone pot, burger, hot dog ramen. I mean, hot dogs in ramen. What's not to like? 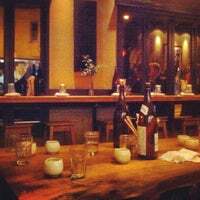 The sake flight is a great pairing, but they have amazing beers so try one you haven't tried. Kimchi and steak rice in a stone pot. The huge plate of mushrooms. 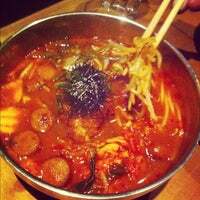 Reasonably priced modern Korean food with big portions. Its worth it to come by early for their happy hour menu. The staff were great and extremely friendly. The food was amazing especially the ox tail deukbokki and tantan noodles. Really small portions for appetizers but the "comfort" dishes are really filling. The okonomiyaki is amazing and so are the dumplings! This family-run Korean spot draws crowds with its market vegetable stone pot, handmade noodles, and shave ice. The lines forming out the door rival its neighbor Bi-Rite Creamery. Big fan of the very authentic okonomiyaki (Japanese savory pancake) and the Bibimbap (stonepot). Definitely put an egg on it! Trendy, hipster Korean done well. Stonepot is much larger than you think! Skip the ramen-style pasta plate, too salty. I love their orange wine. I'm not a heavy drinker but I usually can't help my self from ordering at least 4 glasses of it. 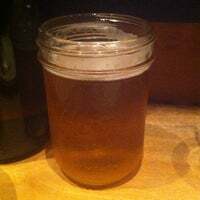 It's one of my favorite things to drink in SF. I've had the stone pot with flank steak over a dozen times. When it's served hold off eating it for about 10 minutes so the rice can cook and get crunchy on the hot stone it's served in. Gotta order the stonepot and add the steak! 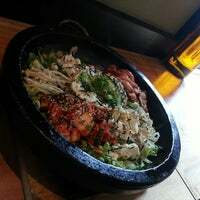 Also order the gamja fries with bulgogi & the beef tongue dish. I love the windows facing out to the street. Never had a bad thing here. The stone pot with flank steak is awesome. Go early for happy hour for the gamja fries and Korean tacos. Standouts also include KFC chicken wings, stonepot rice, okonomiyaki, and dumplings. Get the KFC (Korean Fried Chicken). Comes with gravy and cheese. Come before 7pm to get seats. 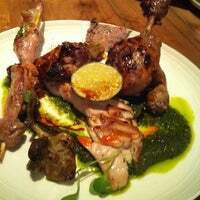 The vibe is casual but the cuisine is refined and top notch. Standouts include the dumplings and the okonomiyaki. 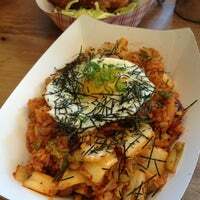 They serve one of the most delicious bibimbap you'll find outside of Korea! Look for "stone" on their menu. Everything actually good, or really good! But also, expensive or really expensive for the portion and quality. This restaurant should definitely be ranked $$$ in my opinion. 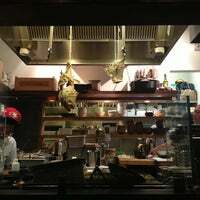 Oxtail (lovely spiciness), beef tongue, dumplings and the Okonomiyaki were the dishes to remember. Get there for happy hour. My Korean wife and I both agree, I must say the gamja fries (topped w/ bulgogi, kimchi, and gochujang) are really something special. Had the pleasure of ordering the Korean fried chicken. Sit at the bar and enjoy the view of Dolores Park! Stone pot and beef tongue were incredible from what I can remember. This was a couple years ago. Delicious Gamja fries, likened to a Korean-style "poutine" with short rib, kimchee, mayo. Go on Wednesday nights for K.F.C. Amazing Korean fried chicken for $20 and worth every penny. The place is pretty small, so I recommend making a reservation. As for fare, go with the steak pot – delish. Korean food that do an excellent stone pot, and have a panko encrusted poached egg in their ramen that's insane! Dumplings and mushroom - absurdly good. The black sesame pudding is one of the best things I've ever had. A family run place. 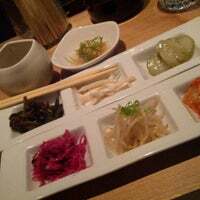 New Korean American (NKA) cuisine is humble, innovative and personal while keeping tradition close to heart. The menu is inspired by the weekly harvests from our farm and the finest local bounty. "You get that puffy egg dish on the house. Side dishes are huge and plentiful. 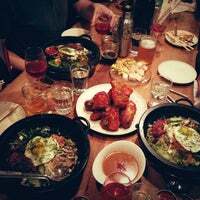 Everything's delicious." "Essa churrascaria coreana é bem cara, mas a comida é bem boa. Não tem muita opção pra vegetarianos e você sai totalmente defumado. Vá preparado!" "É a melhor sorveteria ever!! Salted Caramel TOP! Atendimento super simpático!" 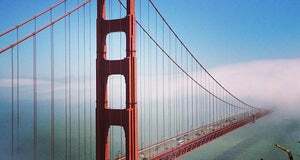 "Esse é o lugar mais cool de todos: grupos se reúnem e curtem suas tardes em família, amigos, namorados. O Parque é um descampado enorme e lindão! Traga uma toalhinha, comida e bebida pra curtir!!" "Não deixe de provar os croissants daqui"